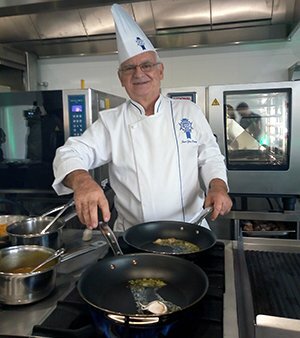 After 50 years of occupation, Chef Jean Yves Poirey has worked in several restaurants in many countries, studied and learned to cook practicing and is now responsible for the Cuisine courses at the Institute of Culinary Arts Le Cordon Bleu São Paulo. To the students, he warns: "To be a good cook you must have a lot of humility to start your career and the desire to learn always." The first steps of his career came very early, while still in the parents' kitchen in French Algeria, Jean Yves was already learning as an assistant, cleaning fish or preparing puff pastry. He chose to study at École Thonon-les-Bains in France for three years and had his first job as a head waiter at Compagnie de Navigation Paquet in Marseille. The chef assumed the kitchen when he entered the Intercontinental Hotel in Geneva and after that, never stopped. Jean Yves entered to the Le Meridien Hotel in 1979, where he worked for 27 years and could experience the cuisine of several countries, such as Portugal, Syria, Kuwait and Nigeria. It wasn't long before he arrived in Brazil, where he worked in the kitchens of the Hotel Le Meridien in Rio de Janeiro and Salvador, and was executive chef of the Rio Othon Palace. For almost 30 years in the country, the chef has adopted Salvador as his new home and loves to prepare salad with grilled fish from a fishermen colony, but also does not dispense a good ratatouille, a classic of French cuisine, originally from the Provence region. What were the challenges at the beginning of your career? 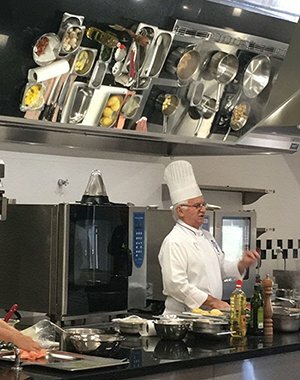 Jean Yves: The difficulties were the meeeting with another world, because although I had a certain practice, there was more requirement and hierarchy, mainly inside the hotels, with the different services, and the kitchens need to communicate in order to work. It's a day-to-day learning. I also see that in the last decades new functions have been created as a consequence of the evolution of the market and the schools that have developed. The kitchens became bureaucratic, the chef's tables disappeared, where he had lunch with the cooks. Despite the rigorous environment, in the past, there was more time to understand people. How did you come to Brazil? Jean Yves:The first time I visited Brazil was in the Carnival, in 1970. I was still the head of waiter at the Compagnie de Navigation Paquet in France. Later, when I was at Le Meridien, my boss, who had already worked in São Paulo, advised me to go to Salvador in 1981. Between comings and goings, through Nigeria, Kuwait, I returned to Brazil and married a woman from Bahia, and I had two daughters. If before, the students had to get a good education outside the country, now we will have the international level in Brazil itself, with cooks from all over the world. After so many years ahead of famous restaurants, what is the new phase as a teacher at Le Cordon Bleu? Jean Yves: During my career, I always enjoyed teaching, giving classes and lessons. On a daily basis from my work at Le Meridian, I was responsible for training many chefs in Rio and Salvador who learned in practice. I am very excited because now I will be able to teach in a school like Le Cordon Bleu. It is also very interesting to see that in the 80's, the profession was very devalued and this occurred until the year 2000, but now people are interested in training and learning. The profession of cook has evolved a lot and is being much more valued. What are the differences in teaching Le Cordon Bleu? 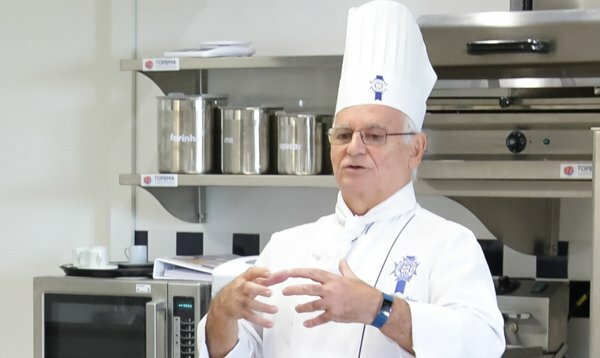 Jean Yves: The institute offers all the necessary concepts for students to be skilled cooks and to quickly get to be good chefs because they know what they are doing, they know the ingredients, techniques and practices very well. In class, they prepare the dishes themselves and know the difficulty and what they need to face in the kitchen. How do you evaluate the last years of gastronomy in Brazil? Jean Yves: Brazil has already greatly improved the level of cooks and products that are worked on, but it has something to improve on. It is necessary to value what is here, especially the producers, farmers and suppliers. They are the basis of our gastronomy! The country has everything to make the best product, but it´s necessary to have more government support. Everything starts with the products, because if the cook does not have a quality raw material, he will hardly prepare a good dish. The country has great climatic conditions, with a great diversity of ingredients. You have everything to grow. 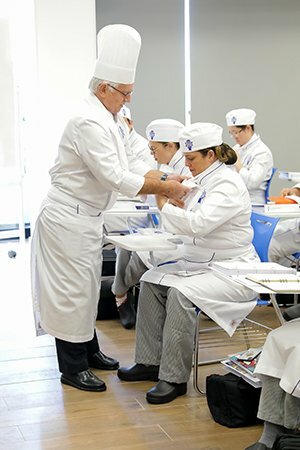 What are the impacts of an international school such as Le Cordon Bleu in Brazil? Jean Yves: The profession will be more valued and recognized. If before, the students had to get a good education outside the country, now we will have the international level in Brazil itself, with cooks from all over the world. As a result, we will have cooks leaving the school who will demand more from the market and the customers will also increase the requirement. But it's a profession that has to be recognized. Currently, few restaurant owners are trained as chefs and know how to value products, equipment and evaluate the workforce. What is your advice to new students coming to the Institute? Jean Yves: To be a good cook it takes a lot of humility to start the career and the will to learn always. Practice is very important! If the student can do internships outside the country, it would be better, since it is enriching to learn other cultures.